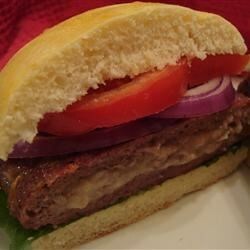 "These are seasoned and stuffed hamburgers with a taste of potato and cheese. Serve on buns with condiments of choice." Breakfast for all day & perfect for Game Day! These were tasty, but I felt the meat mixture was too sticky. I added 1 egg and 1/2 cp. breadcrumbs so the patties would be easier to form. A great new twist for a burger! For those of you having trouble with the potatoes, simply buy a bag of shredded hash browns - very quick & simple! These burgers are HUGE and very yummy. I used the shredded hashbrown poataoes as suggested and they worked great. I also used cheddar instead of swiss cheese. We'll make these again for sure. My husband said that this was the best hamburger he had ever had.